Now that it’s September and we are weeks away from the official start of fall, I’m starting to feel it. I saw a Halloween City open up next to my gym this morning, and I couldn’t be more excited. What kind of fashion enthusiast am I? I get excited about pop-up Halloween stores. Or maybe that just proves how bad my retail addiction is? Anyways, I thought I would post some shopping guides with my favorite fall clothes. First up are jackets. I love everything about military-inspired jackets. The zippers, the gold and brass buttons, the fabrics. Nothing is easier then throwing one over a summer dress and heading out the door. Next, the gray blazer. This is one of my favorite neutrals to layer over dark purple and pink jewel tones. 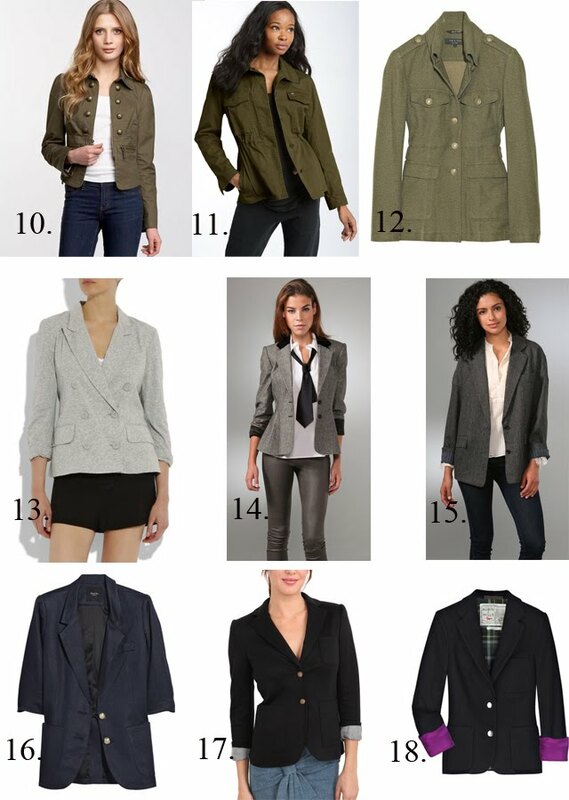 I especially love the soft knit gray blazer from Banana Republic. It looks so soft. And, finally, the navy blazer. It instantly makes me think of fall because of the start of school and it’s scholarly look. And it’s such a nice compliment to the traditional rich colors of fall. One through 9 are some of my favorite retail brands that you can find at most malls and 10 through 18 may be a little harder to find/afford, but luckily Cleveland has its own Saks Fifth Avenue. 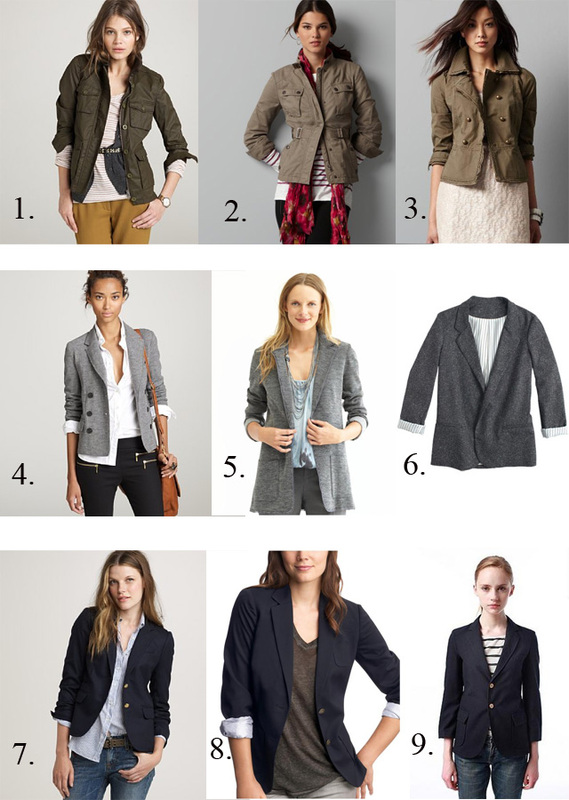 I will be posting part 2 of my favorite jackets for fall next week. So stay tuned. Happy shopping! Blazers AND military jackets!?! Love 'em both! Kristin, what I wouldn't give to have number 1!